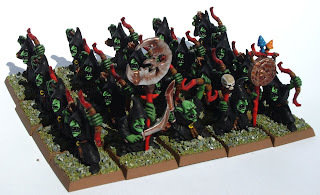 And a unit of Night Goblin Spearmen. As usual, all of them are for sale. 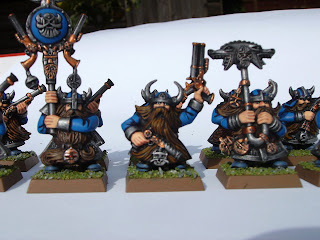 I managed to snipe this lot of Squats on ebay for £5.50, because they were listed by someone who didn't really seem to know how rare they are. Blessed parents selling their kids old junk! I'm not even going to do anything with them, just take a decent picture and relist them with the proper name. 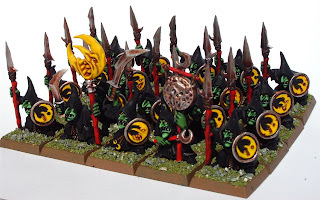 Finished a sizable chunk of the Goblin Army. 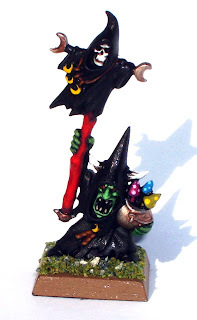 I know I could highlight the black robes grey, it'd improve their finish, but I feel I've spent enough time with these chaps. I'm so ready to do something new. 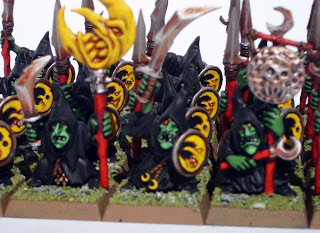 However, it is satisfying to see several units together, all with the same colour scheme. When I put them all together I almost wanted to keep them instead of selling them on ebay in a few days. I like the funky lil mushrooms that pop up here and there. 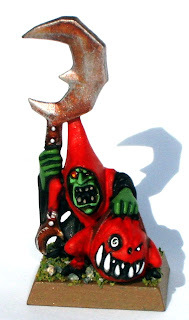 The Goblin Boss's pet Squig had a big enough eye to pop the added detail of a 'glint' of white, something that I've recently been trying to add. 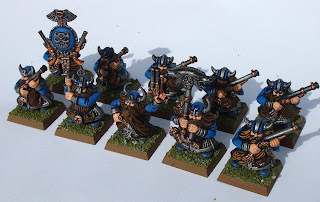 I'm going to sell the lot as soon as I've painted them; have been playing Warhammer with the great little rulebook that comes with the BFSP boxed set, but i'm not really enjoying painting great blocks of troops as much as I do individuals. Having said that, I might still grab a box of the 40k equivalent in September - If i've never painted space marines, I can't really call myself a Games Workshop enthusiast can I?